? Panels (originally known as Question Blocks) are the ground-based version of the ? Block. While ? Blocks hover in mid-air, ? Panels lay flat against the ground. These objects first appear in Super Mario Kart. ? Panels litter the racetracks of the game. When a racer drives over a ? Panel, he or she receives an item. Although normally yellow with a black question mark, ? Panels turn red with a smiley face after driven over, signifying they are deactivated. Red ? Panels remain deactivated through the rest of the race (unless every ? Panel in the course is deactivated, in which case every ? Panel turns yellow and once again offer items). ? Panels are replaced by Item Boxes in Mario Kart 64 and future Mario Kart games.
? Panels later appear in Mario Hoops 3-on-3. These panels are scattered across the game's various basketball courts. When a player on offense dribbles the ball over a ? Panel, he or she typically acquires Coins used to boost points, but may also receive an item. A player on defense always receives a special item if they run over one of these panels. Fake ? Panels also appear in the game and can be used to trip up other players. Purple ? Panels appear in the Jr. Street stage when one of the spotlights shines on the ? Panel. Those contain Slot Coins.
? 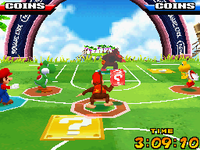 Panels reappear in Mario Sports Mix. They have the same effect as in Mario Hoops 3-on-3. This page was last edited on March 23, 2019, at 22:07.